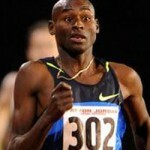 NEW YORK – (September 22, 2012) – For years, Bernard Lagat has dominated Mile races on the indoor track of New York City, his eight consecutive Wanamaker Mile titles at the Millrose Games allowing him to appropriate the “Chairman of the Boards” title from Eamonn Coghlan. 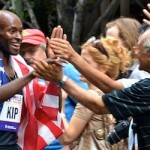 Lagat’s string was broken this winter by a young upstart, Matthew Centrowitz, and on Saturday on the Big Apple’s famed Fifth Avenue, the 22-year-old Centrowitz bested Lagat, 15 years his senior, again, defeating the defending champion with a well-timed and unanswerable kick in the last 50 yards of the race, after Lagat seemed to have made the winning move with 100 to go. 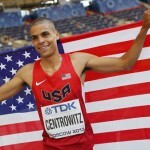 Centrowitz, who finished fourth in the London Olympic 1500 meters this summer, became only the second man to win both Wanamaker and Fifth Avenue, the bookends of the racing season, in the same year. Spain’s Isaac Viciosa was the first man to turn the trick, 15 years ago. The men’s pack went through fairly even 60-second quarter mile splits, and just after the ¾ mark David Torrence, who won the Falmouth Mile in August, made a strong move to the front to try and take the victory with a long finishing drive. Just past the 1500m mark, Lagat made his move, perhaps a bit farther out than he would have desired. Centrowitz, the 2011 World 1500m bronze medalist, crossed the line in 3 minutes, 52.4 seconds, lowering his PR from the 3:53.92 set at Millrose, his half-second margin enough to allow him to spread his arms in victory as he hit the tape. Centrowitz’ London teammate, 1500m silver medalist Leo Manzano, was third in 3:53.1. Youth was also served in the women’s pro race that preceded the men, as 25-year-old Brenda Martinez, whose 4:26.76 PR, set in winning Falmouth, made her the world leader in the distance. After 20 blocks of racing down Fifth Avenue, she still held that distinction, albeit with a new PR of 4:24.2, good for a 0.7 margin over Anna Pierce (4:24.9, also a PR). Her win here, coming on the heels of a victory in last week’s Great North City Games road Mile in England, have gave her a great sense of confidence in not playing her cards until the finish is in sight. Today, that point came with the race was in its final eighth. “I wanted to wait until 200 meters to go,” said Martinez, who was last when she debuted here in 2010 and placed ninth here last year. “I felt very good so around that time is when I started to drop my head, pump my arms and kick for my life. 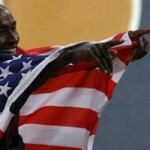 At the 32nd edition, overall, 14 men broke 4 minutes and 10 women bettered 4:30 for the Mile. While two professional races were the highlight of the day, they certainly were not the limit of Mile racing on Fifth Avenue today. Beginning some four hours before the pros, Open runners competed in a dozen age group heats, some of which approached 1,000 in size. Before the day was done more than 5,400 men and women raced, ran or jogged the 80 blocks south from the Metropolitan Museum, proving that when it comes to the roads in New York City, the marathon may be king, but the Mile is not far behind.